It was still before midday. The sun was out, not too warm, just yet, and it was quiet. The noise of the main road calmed down a bit as everyone was either at school or at work. I was studying at home with the doors open, ventilators on, having some “fresh” air going around and not to hear the buzzing of the air-conditioning for once. The view is also so colorful! The garden is green, has some large orchids blooming with wonderful flowers. Looking from the other window there’s an empty field where banana trees are growing, giving some distance to the next buildings. There also always is something happening. Ayah, my father in law, has “green fingers” too. In between brackets as he doesn’t have a plan and is randomly planting something and removing it again without that any plant has given any fruit or veggies for that matter. That particular morning, a couple of days ago, to me a morning not to forget. 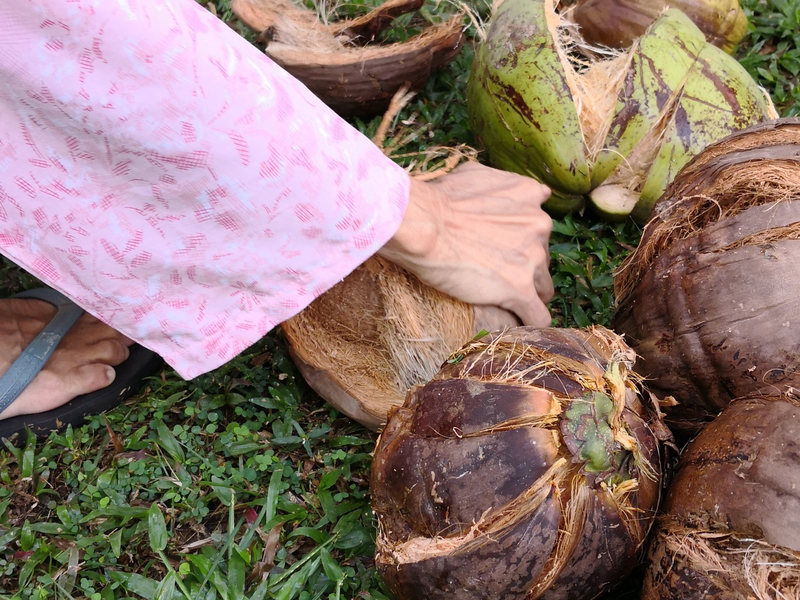 My parents in law “gardening” and harvesting coconuts, to break them, and having nice coconut juice! They are lovely people, simple, retired, enjoying the easy life without any worry at all (consequently, they worry about everything all the time). They have a big heart, welcomed me home into the family and I’m grateful for this new memory! How does your garden look like? Prev Post: What is Poverty (and consequently Development) really? Rambutans are amazing! You are lucky to be living in close proximity to these fresh tropical fruits. Fresh coconut water is the BEST. That would be so AWESOME Thank you! Thanks for passing by! I spend quite some time writing, not only for myself but also for you! The blog runs so much better on coffee which I absolutely love! Unlock my brains even more by buying me a coffee! Hi there! Thanks for passing by! Did you enjoy this article? Enter your email address to get awesome stories like this and much more!